Introducing WatchMate Vision² with a highly responsive, easy to use capacitive touchscreen, bright display, stylish looks, increased WiFi connectivity and lots more. Powered with smartAIS technology, Vision² has safety features that can save lives. Get proactive alerts when you have potential collision situations, if your anchor drags or if there’s a man overboard situation. With its intuitive and easy to use touch screen, scroll through the menu, zoom in and out, see vessel details and navigation data, change alarm settings and more with the most gentle of touches. Remote control your transponder from anywhere on board with your smartphone, tablet or smartwatch using WiFi. The Vision² enables you to connect up to eight devices simultaneously for greater flexibility. 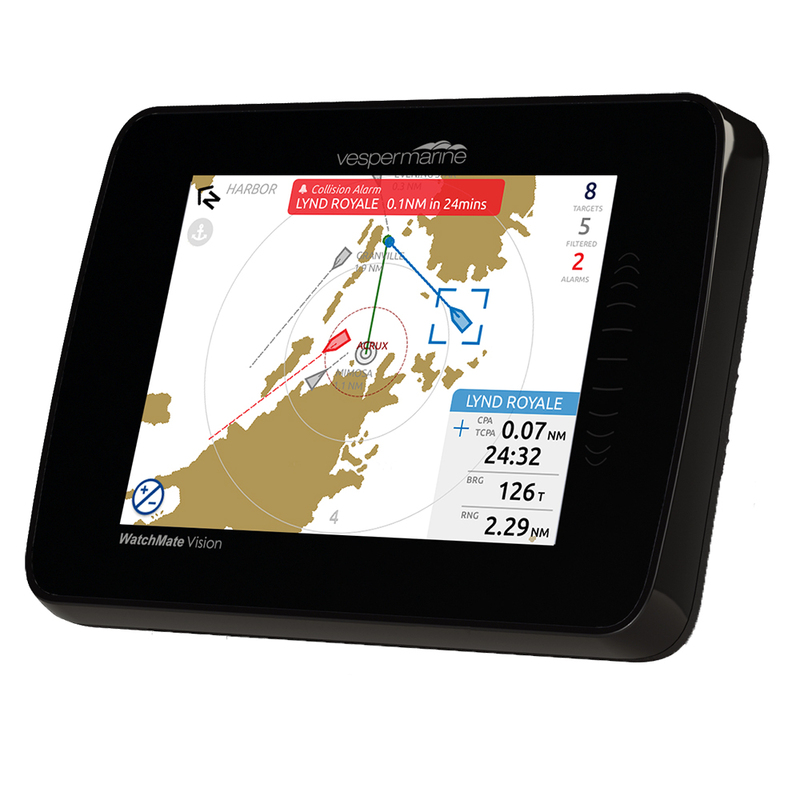 The Vision² has a stylish black bezel front panel with glossy black side panels, designed to complement every helm and Nav station. The bright 5.7 inch color touchscreen has a radar plotting display with worldwide coastal outlines for better situational awareness. The screen magnifier allows you to select targets without losing position context and scale. The screen has excellent optical clarity over a wide viewing angle and can be viewed using polarized glasses. Anchor Move: After setting your anchor position, you can fine tune its position for greater accuracy.